It is thought that Sakurajima first became active about 13000 years ago. Sakurajima with a circumference of about 52km is the one of 4 biggest volcanos in Japan : Mt. Mihama (near Tokyo), Mt. Asama (Gunma Pref. ), Mt. Aso (Kumamoto) and Sakurajima. Sakurajima is created by 3 peaks of the North peak, Kitadake (1117m high), the middle peak Nakadake (1060m) and the South peak Minamidake (1040m). Now, the South peak is only active. 60 % of Sakurajima is Shirasu which is light sand. Sakurajima has been changing its shape by repeated eruptions. There are many eruptions recorded in history. There were four major eruptions in history which is Bunmei eruption (1476), Anei eruption (1779), Taisho eruption (1914) and Showa eruption (1946). In the Anei eruption, over 140 people died. Sakurajima island was joined to the peninsula in the Taisho eruption in 1914. The smoke from the Taisho eruption rose up to over 8000m, and the ash was blown as far as the Kamchatka Peninsula in Russia. About 3 million tons of lava gushed out of the volcano for about one month. The lava flowed and buried Karasujima where was located about 500 m off shore of Sakurajima, and joined the Sakurajima island to the Osumi peninsula. 35 people died and 23 were reported missing in the Taisho eruption. Now, only the South peak has been active for 30 years ago. In literally, Sakurajima means Cherry blossom island. Some people think that it named Sakurajima because there are many cherry blossom trees in Sakurajima. It would be very beautiful if Sakurajima was filled with pink cherry blossoms..... but, it is not. There are many sayings about name. One saying is like this. Goddess called "Konohana Sakuyahime" who appeared in legend was defied in Sakurajima, so that people used to call the island as "Sakuya-jima (Sakuya island)". But the name changed to "Sakura-jima" in history. One is saying that when this island was created, cherry blossoms were also floated over the sea around the island. Or It was taken from the name of "Sakurajima Tadanobu" who was a local dignitary. People used to climb Sakurajima until about 50 years ago. 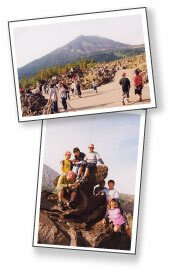 Many students climbed Sakurajima as a school trip. Students climbed to the peak of mountain and even to inside of the crater. At that time, many people visited Sakurajima for hiking. Now, climbing Sakurajima more than the 4th stage where Yunohira observatory is not allowed. The most well known products of Sakurajima are the world's largest Sakurajima daikon radish and the World's smallest Sakurajima mandarin. Both are raised in Sakurajima's volcano ash soil. Sakurajima radish is called "Shima-dekon" by the local. It is the biggest and heaviest radish which is recorded on the Guinness Record. The record is now 29.6kg!! Sakurajima radish is more juicy and tender than other radishes. The harvest time is around December. "The World Biggest Sakurajima daikon radish contest" is held in Sakurajima every year. It can be eaten cooked with soy sauce, dried in strips or pickles. Sakurajima mandarine or "Shima-mikan" is about 3cm in a diameter. It is more sweet than other mandarine. Many other vegetable and fruit like "Biwa (Japanese loquat)" are produced. In May or June, you can see it covered with white paper bags. It is to protect the fruit from harmful insects and volcanic ash. Volcano Sakurajima brought us treasure of hot-spring. Located along the seashore in the South of Sakurajima is Furusato Hot Springs. Four inns and hotels line the road at Furusato Hot Springs, each has outdoor hot springs. At the Furusato Kanko Hotel, you have to wear white "yukata (cotton kimono)" to take outside hot spring. The view of Kagoshima City and bay while soaking in the outdoor hot spring is splendid!! I recommend to go there just before the sun sets. There are 2 other Hot Springs; Sakurajima Magma Hot Spring near Sakurajima port, and Shirahama Hot Spring Center in the North of Sakurajima. Shuttle buses for Furusato Hot Spring and Shirahama Hot Spring are available from the port. Do you have an idea how many tourists from abroad visit Kagoshima ? About 80,000 foreign tourists per year come to Kagoshima for traveling (83,926 tourists in 2000)!! By nationalities, the largest group of tourists comes from Hong Kong (37,707), then Korea (19,363), Taiwan (7,389), USA (5,860), and finally China (1,189). (Numbers of tourist in 2000) Although traveling alone or in couples has been increasing, travelers from Asian countries like Hong Kong and Korea still travel in big guided groups. You may have seen them in the middle of Tenmonkan arcade sometimes. People who travel alone or in couples are usually "backpackers", which is a very casual way to travel, always with a backpack on their back! Most backpackers are from Western countries, and even in Kagoshima you will sometimes see them around the city. They usually get information about the places they want to visit through internet, or backpackers guide books. In Kagoshima city, there is a family-run inn "Nakazono Ryokan" which is a member of Japanese Inn Group near Kagoshima City hall. About 70% of their visitors are foreigners, due to the cheap accommodation rate. There are some regular visitors who visit Kagoshima and stay there every time. This year, a German tourist group came again in September, and I decided to join them for one day. 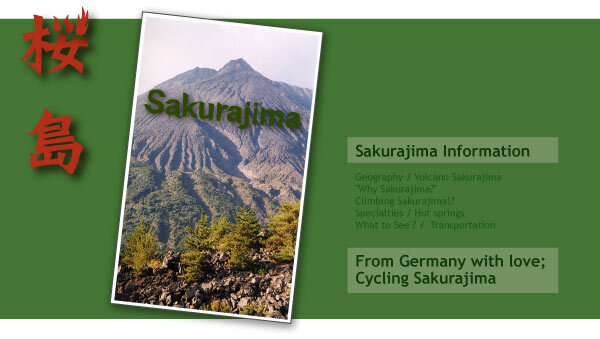 They made a cycling tour around Sakurajima. I met them at the bicycle renting place. The guide, Mr. Wolfgang, who speaks very fluent Japanese introduced me the group. They were very nice, three men and two women, with a wide range of ages. The guide was a former foreign student in Hokkaido. He liked Kagoshima since the first time he came here. For this day I also became part of the group. I was surprised, when I knew that nobody knew each other before the trip, and all met in Osaka for the first time! Mr. Wolfgang told me how he and his travel agency designed this kind of travel for small groups (5-8 people) during 3 weeks around Japan, not only visiting the usual sightseeing spots or cities, but also small towns where you can feel the nature and the local lifestyle, staying in budget places and using public transportation to be closer to local people. After getting off from the ferry in Sakurajima, we headed to the left where a residence area is near the Sakurajima port, and the road is smooth and extended by the bay. We saw the fish cages in which fishermen told us, they culture "Kampachi" and "Yellow tail", very common fishes in the area. 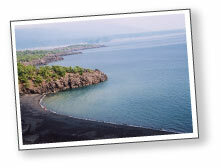 After a while, we reached Saidou beach, which is the only natural beach in Sakurajima. For the German people, that wasn't certainly the idea of beach though. Mr. Wolfgang got a flat tire, but fortunately we found a very kind man who helped him to change his bike at the bicycle renting store. In the meanwhile, the rest of the group took a break and rest on a nice small beach with black and brown small light stones, next to a small fishing port. One of the guys finally decided to swim, so changed clothes and jumped in the water: This was the first time to swim in the Pacific he said!! Others walked along the beach picking up shells and wood. When Mr. Wolfgang came back with a new "mama-chari" (usually for ladies), we started our trip. After a while, the road became gradually an upward slope. We started to see many brown pine trees and it was quite strange since pine trees don't change color with seasons. We knew later that pine trees have been dying, due to a special insect that attacks them. The bay disappeared from our sight and the road slope became quite steep, so that we walked for a while. Once we got the top downhill was very nice and curves were exiting! There was a small wooden cottage with some cars parked in front. We stopped by, and an old woman was selling Sakurajima small sweet mandarins and bottles of golden colored camellia oil. On the ground, seeds of camellia to produce oil were placed to dry. People use the oil for the hair. After drinking juice we continued our trip. We realized how Sakurajima has some small bays with artistic shape lava rocks, greenery pine trees, a clear dark green sea and many fishing boats inside. When you see it from the hill, these bays look like hidden secret bays. In the East side of Sakurajima, we didn't found many houses; only sea or green. From the foot of the mountain to mid way up the side, you could see only greenery fields, but somehow they were strange. Looking carefully you were not able to see single trees and most trees were covered by a weed like ivy. It looked like as if you put over a huge net of ivy on the field from the air. Houses appeared gradually and finally we reached the buried gate, which is a Shintoist shrine gate buried by lava in the huge eruption of 1914. This is the only thing that remains from former eruptions. The place is often visited by tourists; during our stay there, we saw around 8 groups, including a Polish one. there, we found the Arimura viewpoint, which is one of the main sightseeing spots in Sakurajima, usually busy with people. We stayed for a while. After the Furusato hot spring, we could see the rocky surface of Sakurajima. The road became flat with sea and lava field to our left and lava field and Sakurajima to our right. We reached the Lava road. After the lava road, we saw a residence area and after it we found a "Sakurajima-yaki kiln", which is Sakurajima pottery made with glaze containing volcanic ash and using hot spring water. They are usually shiny black or dark brown color and it is one of Sakurajima's specialties. We finally arrived to Sakurajima port again. We all were quite tired but really satisfied with our bike tour around Sakurajima.